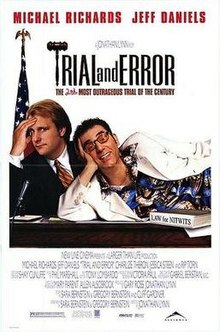 Brief Synopsis – After getting drunk the night before a big trial, a lawyer has his actor friend stand in for him for a seemingly easy court case. My Take on it – This is a film that I never heard of beforehand and now I understand why. The premise and execution is completely off the wall and doesn’t work at all. There are a few scenes that are mildly entertaining but overall this film was terrible. Jeff Daniels and Michael Richards have no chemistry together which hurts the fact that they are meant to be life long friends for decades. The courtroom scenes are filled with really silly antics and the fact that they forget that the audience has been inundated for decades with legal dramas and are smarter than they assume which makes much of what happens quite laughable. This film is yet further proof that Michael Richards is great as Kramer in Seinfeld but doesn’t work well in any other format. This is both fortunate for us all (he WAS great in Seinfeld), yet terrible for any other roles that he has been given besides that one including the one in this film. Bottom Line – Silly premise that does have its moments. Richards and Daniels have no chemistry what so ever which hurts the fact that they are meant to be best friends for decades. The courtroom antics are quite laughable especially since we’ve been crammed with legal dramas for decades and the audience isn’t as naive as this film makes us out to be. This film is further proof that Richards is great as Kramer but that doesn’t men that he can be good in any other role which is both fortunate and unfortunate.